This weekend, I played around with one of my Mom’s recipes and ended up with these key lime cookies from scratch. My Mom’s key lime cookies with sweetened condensed milk tasted more like macaroons rather than cookies…lol. The taste was great but I just had to make the texture more cookie-like and finally, SUCCESS! These key lime cookies with coconut have all the flavors of a CLASSIC chewy sugar cookie but with a zesty twist. 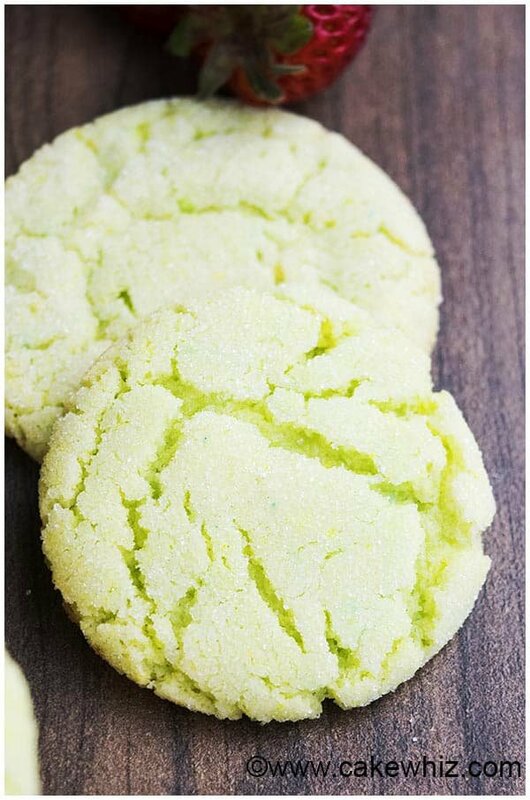 These ZESTY key lime sugar cookies have an amazing CRACKLY and crinkly texture, making them IRRESISTIBLE! 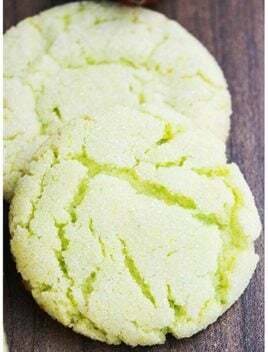 How to make key lime cookies? The process is very SIMPLE. Start off by creaming together butter and sugar. Then, mix in the egg, vanilla extract, lime extract, lime juice, lime zest and gel coloring. In a separate bowl, whisk together the flour, coconut, baking powder and baking soda. Dump this dry mixture into the wet mixture and mix until just combined. Roll out small balls of cookie dough and cover them in granulated sugar and place them on a cookie tray, lined with parchment paper. Chill the tray for a bit and then, bake! 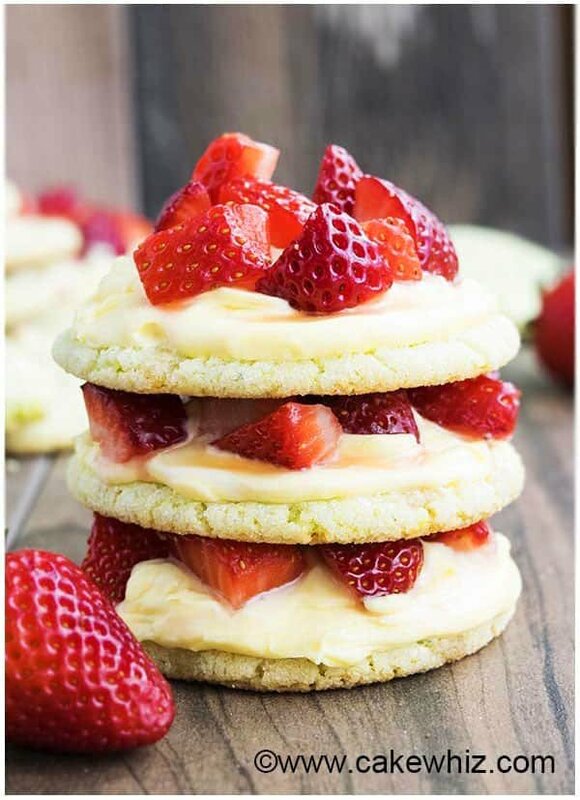 To make strawberry lime cookies, spread frosting on top of each cookie and place a few sliced strawberries. Make sure to place your sliced strawberries on a few sheets of paper towel so as to get rid of excess water first. Also, since fresh strawberries are used, store leftover cookies in the fridge. 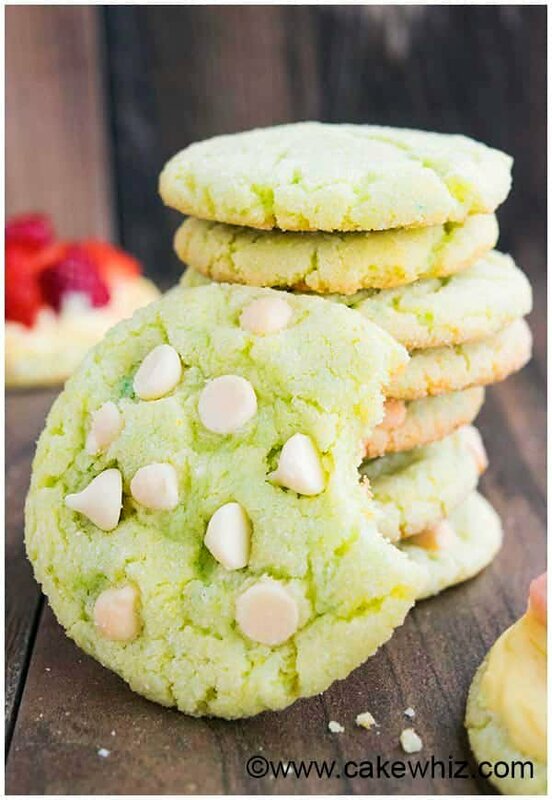 To make key lime cookies with white chocolate chips (key lime white chocolate cookies), add 1 1/4 cups white chocolate chips into the batter. To make key lime cookies with powdered sugar (similar to key lime snowball cookies), bake smaller cookies and roll each baked cookie in a bowl of powdered sugar until fully covered. To make key lime cookies with sugar cookie mix, prepare the cookie dough according to the box instructions. Then, mix in 1 tbsp key lime zest, 1 tbsp lime juice and 1 tsp lime extract. To make key lime cookies with cake mix, make cake mix cookies according to my instructions HERE but use a yellow cake mix instead of chocolate cake mix. Then, add 2 tbsp key lime zest, 1 tbsp lime juice and replace vanilla extract with 1 tsp lime extract. To make key lime cookies with glaze, top off each cookie with thinned out royal icing or glace icing. You can even add 1/2 tsp lime zest and 1 tsp lime extract in the glaze. To make key lime cookies with icing, frost the top of each baked cookie with my American buttercream frosting OR Flour buttercream (Ermine frosting) OR you can even make key lime cookies with cream cheese frosting. I also did something totally CRAZY…. I frosted each cookie with key lime buttercream frosting, tossed some sliced strawberries and then STACKED them on top of each other. 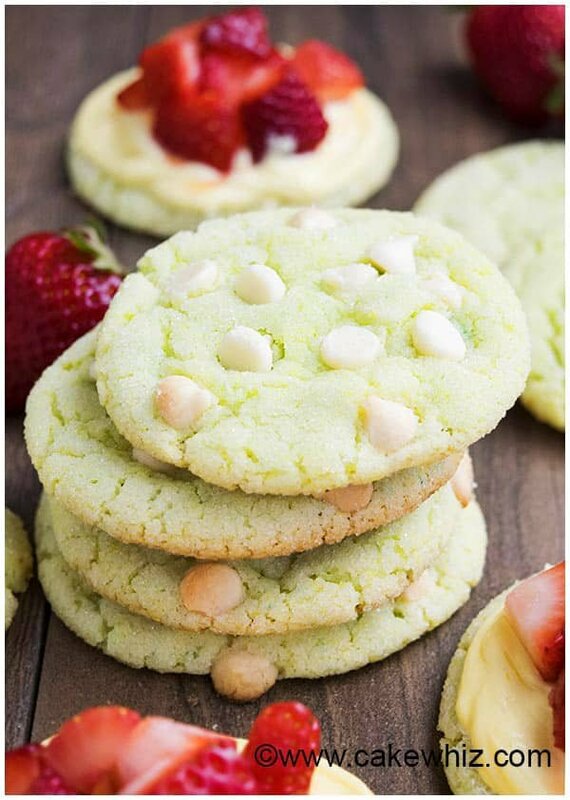 These key lime cooler cookies were so PRETTY but very messy to eat…lol. So, if you do this, just use 2 cookies and make key lime cookie sandwiches instead of a stacked tower. For best results, use fresh key limes and not the bottled stuff. Your butter and egg must be at room temperature. This recipe makes about 35 lime sugar cookies but that number can vary, depending on how big or small you make your cookies. You can use sweetened or unsweetened shredded coconut. I prefer unsweetened or else the cookies are a little too sweet for my liking. You will know cookies are baked and ready when they are firm and golden brown along the edges. Leftover cookies can be stored in a cookie jar at room temperature for up to 3 days. Mix in the egg, vanilla extract, lime extract, lime juice, lime zest, gel coloring until smooth. In a separate bowl, whisk together the flour, shredded coconut, baking powder, baking soda. Scoop out small portions of the dough and shape them into balls. Roll them in a plate filled with granulated sugar. Place them on a cookie tray, lined with parchment paper and chill the tray for 15-20 minutes. Then, bake at 350 degrees for about 15 minutes or until the edges are firm and golden brown. Allow these cookies to cool down and enjoy! - Leftover cookies can be stored in a cookie jar at room temperature for up to 3 days. Gimme anything Key Lime! Totally craving these! Where on Earth do i find key lime extract?? Amazon has it. It’s the McCormick brand. These look delicious! Is it possible to leave to coconut out? I don’t recommend it because I think it helps with the overall flavor and texture. If you omit it, let me know what you think.